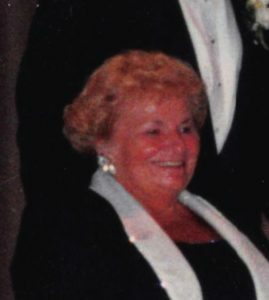 Frances T. (Szymaszek) Jezak, 90, of Lowell, passed away peacefully on Tuesday, April 9, 2019 at Lowell General Hospital. She was the widow of the late Joseph Jezak who passed away 20 years ago. She was born on December 3, 1928 in Lowell and was a daughter of the late Stanley Szymaszek and the late Julia (Lis) Szymaszek. She was raised in Lowell where she attended the area schools before graduating from Lowell General Hospital Nursing School. After becoming a Registered Nurse, she worked at local hospitals, nursing homes, and as a private duty nurse throughout the Greater Lowell Area, retiring from Tewksbury State Hospital. Frances resided in the Belvidere neighborhood of Lowell and was a communicant of Holy Trinity Church. She enjoyed traveling all over the world and also enjoyed trips to the casinos with her friends, shopping, and spending time at the beach. Although she had many passions throughout her life spending time with her family brought her the most happiness. Frances is survived by her five children, Patricia Ann Nastek and her husband, William of Napa, CA, Robert Jezak and his wife, Denise of Pelham, NH, Anne Marie Coulter-Jezak of Hudson, NH, Joseph Jezak Jr. and his wife, Renee of Dracut, MA, and Juliann Draper and her husband, Robert of Salisbury, MA. She is also survived by her 8 grandchildren, Jason Coulter, Willie Nastek, Kevin Nastek, Danny Nastek, Krystopher Draper, Olivia Draper, Tyler Jezak and Joey Jezak; her great grandchildren Connor, Mason, Carson, Mattie, Brandon and Gracie Nastek, and Mya Belle Draper; and her sister, Stasia Jantas of Lowell; and her dear friends, Joanne and Paula. ON SUNDAY, APRIL 14 YOU ARE INVITED TO HER CALLING HOURS FROM 1-4 P.M. AT THE MAHONEY FUNERAL HOME, 187 NESMITH STREET, LOWELL 978-452-6361. ON MONDAY, HER FUNERAL WILL BEGIN AT THE FUNERAL HOME AT 9 A.M. FOLLOWED BY HER FUNERAL MASS AT HOLY TRINITY PARISH, 340 HIGH STREET, LOWELL, AT 10 A.M.. BURIAL WILL TAKE PLACE PRIVATELY IN HOLY TRINITY CEMETERY. DONATIONS IN HER NAME MAY BE MADE TO: FRESENIUS KIDNEY CARE, 847 ROGERS STREET, SUITE 101, LOWELL, MA 01852. Thoughts and prayers are with you and your family I’m so sorry for your loss 🙏😢. So sad at Mom’s passing. I will always remember her jovial laugh. I pray that your lifetime of wonderful memories will ease your sorrow at this difficult time. My thoughts and prayers go out to you during this time. She is now at peace and is no longer suffering. I will always remember our trip to Las Vegas. What a great girls weekend that was. R.I.P Frances. May you rest peacefully, I’ll miss your sense of humor and smile! Prayers to your family & friends always! Will keep you in our prayers at this time of such a great loss. I’m sure she is looking down at you and yelling BINGO I finally won!